(Baltimore, Maryland) – The Professional Numismatists Guild (PNG) presented a Lifetime Achievement Award to well-known researcher, author and rare coin dealer John "J.D." Dannreuther of Memphis, Tennessee. The surprise presentation of the award was made during the organization’s annual PNG Day banquet conducted this year in Baltimore, Maryland. Dannreuther joined the PNG in 1978. 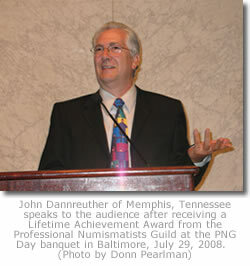 "John Dannreuther is getting the Lifetime Achievement Award for over 30 years of dedication and devoted service to numismatics. John is one of the founders of the Professional Coin Grading Service (PCGS) and one of the nation’s top numismatic scholars. Although John certainly has ‘paid his dues,’ he continues to serve our profession and hobby as a teacher, dealer, researcher and writer," said PNG Board Member and Immediate Past President Jeff Garrett of Lexington, Kentucky who presented the award. The Abe Kosoff Award, named after PNG’s Founding President and presented to a PNG member who has made a significant contribution to the Guild or the numismatic fraternity the past year, was given to Mark Salzberg, Chief Executive Officer of Numismatic Guaranty Corp.
"Mark Salzberg has raised his hand and gotten out his checkbook for every cause that benefits the hobby. He is not only a great example of a forward-looking thinker, which often is rarer in our profession than many of the coins we sell, he also gets involved hands-on through NGC to make things happen. The Art Kagin Ambassador Award, named after a former PNG President who passed away in 2005 and presented to a collector or dealer who provided distinguished service as an advocate of numismatic goodwill, was given to collector John McCloskey of Ohio. "John McCloskey is one of the best numismatic ambassadors, using his friendly, low-key personality to happily share his collecting interests and knowledge with newcomers and advanced numismatists alike. Decades of his service to the Liberty Seated Collectors Club and John Reich Collectors Society, as well as his methodical and objective study of 19th century coinages, make John one of the most admired and respected hobbyists of today," said PNG Secretary Jonathan Kern of Lexington, Kentucky who presented the award to McCloskey. PNG member-dealer and former American Numismatic Association President, Anthony Swiatek of Manhasset, New York, received the Significant Contribution Award, presented to those who have made exceptional, beneficial efforts on behalf of PNG and the profession. "Through his books and newsletters about U.S. commemoratives, his consumer protection seminars and his service as a hobby leader, Anthony Swiatek has an outstanding, decades-long record of valuable assistance to collectors and dealers nationwide," said PNG Treasurer, Jeffrey Bernberg, who presented the award. The Robert Friedberg Award, named after a distinguished numismatic writer and publisher and presented to an author in recognition for an outstanding book or other literature, was given to Michael F. Moran, author of "Striking Change: The Great Artistic Collaboration of Theodore Roosevelt and Augustus Saint-Gaudens," published by Whitman Publishing. "A damn fine book!," said literary committee chair, Richard H. Ponterio, who presented the award. "It provides readers with insight into the personalities of a dynamic President who wanted artistic greatness on our money and the renowned sculptor whose monumental visions were beautifully translated onto coins." PNG leaders also recognized David Hendrickson of Winchester, Indiana for 25 years of membership in the Guild. The PNG is a nonprofit trade association composed of the country’s top rare coin and paper money dealers who must adhere to a strict Code of Ethics in the buying and selling of numismatic merchandise. For additional information about PNG, contact Robert Brueggeman, PNG Executive Director, 3950 Concordia Lane, Fallbrook, California 92028. Phone: (760) 728-1300. E-mail: info@PNGdealers.com. Online: www.PNGdealers.com.